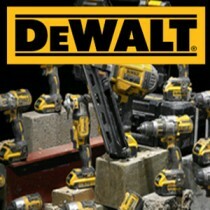 DeWalt Powertools ranging from 10.8V to 54V including the most popular 18v cordless tools. The world’s first 54v (Flexvolt) tools which enable long run-times and un-matched performance. DeWalt also have a range of 110V & 240V mains powered corded Tools.